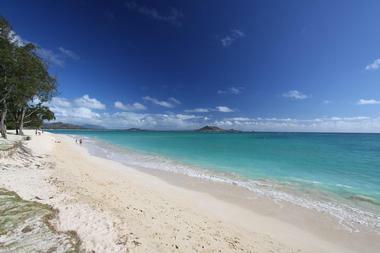 No place on Earth has so many spectacular beaches as Hawaii. Clear blue waters wash miles and miles of soft white or black sand. While the beaches in the south are family friendly with soft surf and are great for swimming and snorkeling, windward beaches are the places where surfing became a world-famous sport. In the summer, visitors can enjoy a cool swim but in the winter, when the wind picks up and enormous, up to 30 feet high waves start pounding the shore, brave surfers come to catch the next big wave. Surrounded by lush vegetation and often by dark volcanic rocks, Oahu beaches are the stuff dreams are made of. 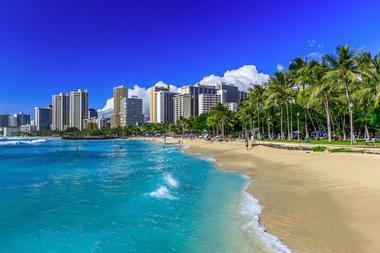 Iconic Waikiki Beach is one of the most famous beaches in the world. Located on the south shore of Oahu, Waikiki is the renowned upscale neighborhood of Honolulu that was once a playground for Hawaiian royalty and is today the home of Oahu’s main resorts, hotel, and restaurants. It attracts millions of tourists from around the world. The hotels are only a few blocks from the shore and the magnificent Waikiki beach. With miles of fine golden sand and a backdrop of Diamond Head, another Honolulu icon, Waikiki Beach is picture perfect, and a perfect place for a swim, snorkel, enjoying the sun, learning to surf and watch the endless ocean stretching to the horizon. 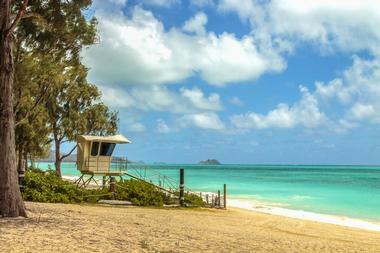 Ala Moana Beach is a half-mile long man-made beach between Waikiki and downtown Honolulu. It is popular among locals and often less crowded than the more famous Waikiki Beach. The beach was created in the 1950s by the owner of the Dillingham Dredging Company, who dumped his dredged sand in the park, creating the beach. 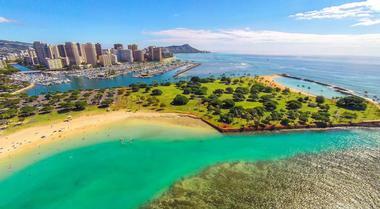 Ala Moana is protected by the outer shallow reef, and the water is always calm, making the beach great for swimming, paddle boarding, picnics, and long strolls along the water. Kids and those learning to swim love its warm, calm waters. There are buoys close to the reef, marking the area as reserved for stand-up paddle boarders, while the swimmers should stay closer to the beach. Hanauma Bay State Park has one of the most beautiful beaches in the country. It is probably the only beach in the world where you have to watch a video before you are allowed to enter. The beauty of the beach is also its undoing, since more than 3000 people visit it every day, and years of too much use and abuse led the authorities to enforce education via video and dole out stiff fines for people who do not follow the rules of conduct. The magnificent curved bay – a sunken volcanic cone – and its golden fine sand is now pristine again. It is part of the Hanauma Bay Nature Preserve, an underwater park and protected marine life conservation area. The park is closed once a week and on holidays to allow marine life a respite from tourists. 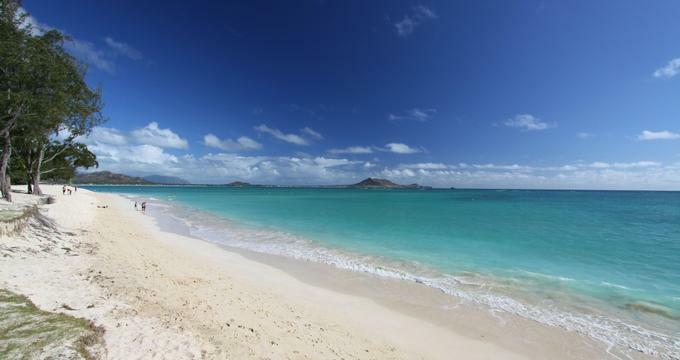 Only about a half hour from Honolulu on the windward side of Oahu, Kailua Beach is often declared as one of the most beautiful beaches in the States. With a half-mile of powder fine white sand, clear azure water, and constant gentle breezes, Kailua Beach Park is a popular locals’ getaway from the crowds of Honolulu. 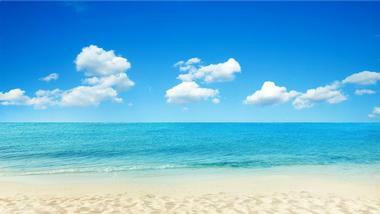 It is great for swimming, surfing, kayaking, snorkeling, diving, and parasailing. There are several shops renting out sports equipment. The nearby small islands are fun to visit with a kayak, and you can find many small restaurants offering tasty local food along the road to the beach. Shaved ice is the most popular refreshing treat on a hot day. Visitors often pick up food to eat on the grassy picnic area on the beach with a perfect view of the ocean. Lanikai Beach is small but beautiful half mile long strip of fine golden sand on Oahu’s windward side in Lanikai in the town of Kailua. There is a small path going to the beach between mostly upper-class residential properties. The beach is public property; it is not part of a park and has no facilities such as showers, restrooms, or lifeguards. Nevertheless, it gets very crowded, especially on the weekend. The view from the beach of two small islands is magnificent, and the beach is a popular spot for photoshoots. People like to kayak to the islands but can land only on the larger one, as the smaller island is a bird sanctuary. Located on Oahu's west coast, Makaha Beach Park is a great swimming, surfing, and bodyboarding beach. The ocean is calmer in the summer, so swimming is better then. In winter, strong surf and a dangerous rip current make it suitable only for experienced surfers. There are normally signs posted about the conditions, which can change at any time, so pay attention. There are lifeguards on the beach, so if you’re not sure, check with them. In general, swimming is better towards the center of the beach, where there is a break in the reef. Surfers like the northern end where the surf breaks on the reef, but the reef is close to the surface, and it is sharp and dangerous. There is not much shade on the beach, so bring an umbrella. The beach is rarely crowded except on weekends when local families come to picnic. For divers, there is the well-known site of Makaha Caverns offshore. Most people come to this part of Oahu’s windward side to visit the scenic Makapuu Lighthouse and are surprised to find the lovely Makapuu Beach far below Makapuu Point in a small cove with fine soft sand that cascades toward the ocean. There are dark lava rocks around the beach, and the beautiful Makapuu lighthouse stands like a beacon almost at the top of the mountain. The waves are often large and crash with thunder onto the shore. Experienced locals bodysurfers and bodyboarders ride the waves on the right side of the beach. At times, the currents become very strong and it is a good idea to check the condition of the surf with the lifeguard before challenging the waves if you are not experienced and familiar with the area. 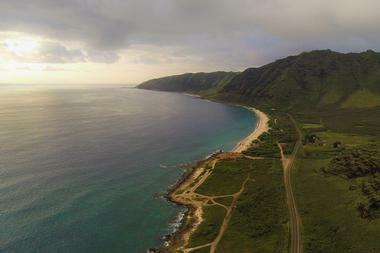 Over a mile long, Malaekahana Beach is located in Malakahana Bay on the northeastern coast of Oahu between La'ie and Kahuku. This beautiful white sand beach is perfect for long walks, ball games, and sunning. Most of the year, but especially in the winter when the surf is up, it offers great surfing and bodyboarding. There are no lifeguards on the beach and the currents can be strong, so enter the water with care. 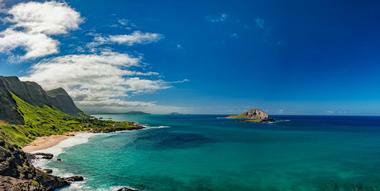 On the south end of the bay, just offshore, is the small Moku'auia Island or Goat Island. You can swim to it or surf, and in low tide the water is shallow enough to simply walk there. 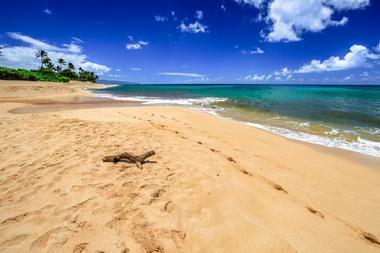 The beach on Goat Island is even more beautiful, with white sand and green turtles that can be often seen. The center of the island is a bird nesting area and is off limits for people. In the winter when strong waves are pounding all other the Oahu beaches, Pokai Bay beach is calm and inviting thanks to the large breakwater in front of it. Located on the island’s west side, this wide 15-acre sandy beach is popular with families with kids, but it is also great for beginner swimmers. On the weekend, you will see lots of families having a picnic in the spacious grassy area next to the kids’ playground. Swimming areas are clearly marked with buoys. Pokai beach is also a popular canoe-launching place. On one end of the bay is Kane'ilio Point, a long peninsula where you can visit the Ku'ilioloa Heiau, an ancient Hawaiian temple. Located on the southeast tip of Oahu, Sandy Beach is a popular 1,200-foot long golden sand beach offering a great getaway from the Waikiki crowds for a day of lying out in the sun. Wide and flat, the beach is great for long walks, flying kites, or throwing a Frisbee, but swimming is recommended only on the quietest days when there are no waves. Sandy Beach has a reef shore break, and the surf breaks very close to the shore. That and the fact that the beach is facing the island of Molokai and that there are very strong currents off the Molokai Channel make it perfect for body surfing and boogie boarding, but it is very dangerous for swimmers. But the larger the surf, the more the local kids love it, and you can watch them riding the waves with incredible grace, defying the danger. Located on Oahu’s north coast past the world famous Banzai Pipeline with its perfect and enormous barreling waves is Sunset Beach, a two-mile long stretch of fine gold sand. Part of the Sunset Beach Park, the beach makes the drive along that stretch of Kamehameha Highway very scenic, as the road winds along the beach. 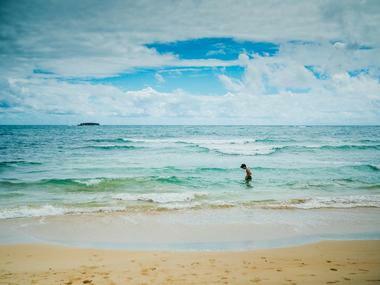 Sunset Beach has two faces: in the summer, when the waves are small, it is a great beach for swimming and snorkeling. And in the winter, you can come here and watch big-wave surfers brave the 15 to 30-foot waves. Sunset Beach Oahu is one of the three sites where the world-famous Triple Crown Surfing Contest is held. And, of course, it is the best place on the island to watch absolutely breathtaking sunsets. Diamond Head Beach Park is a two-acre park east of Waikiki at the foot of Diamond Head, the ancient extinct volcano crater. Steep rugged cliffs and a narrow rocky shelf stand near the small narrow beach that stretches between the Beach Road and the Diamond Head Lighthouse. The beach is not very good for swimming because of the reef, but it is great for surfing and is much less crowded than Waikiki Beach. 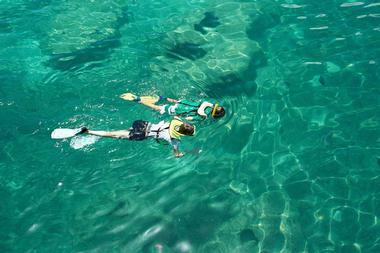 When the waves are not too high, the reef makes it very interesting for snorkeling. At low tide, there are many people strolling across the beach looking at the tide pools. Located only about a 45-minute drive from Honolulu’s Waikiki Beach, Waimanalo is the picture many people imagine when they think paradise: three miles long slope of fine golden sand shaded by giant ironwood trees, clear azure blue waters, blue sky, a light breeze, and endless ocean. Waimanalo Beach is the longest white-sand beach on Oahu, and it is the perfect place for a romantic beach stroll and a bit of solitude. But on the weekends, especially in the summer, Waimanalo Beach is packed with families firing up their barbecues and kids frolicking in the soft surf. In the winter, since the beach is on the island’s windward side, the wind picks up and the water is much better for surfing than swimming. Located on Oahu’s windy North Shore, Waimea beach is a beautiful beach with wide stretches of fine white sand perfect for sunbathing and picnicking. During the summer, the waves subside and make the waters great for swimming. Youngsters love to jump off the large volcanic rock outcropping in the bay. The surf can pick up suddenly, so it is important to pay attention to the warnings posted on the beach. In the winter, Waimea is the place where surfing pros come to catch the next big wave. In the 1950s, during the rise of big wave surfing, Waimea Bay was the place where experienced surfers started to challenge the powerful waves every winter brings to Waimea. Today, the Big Wave season that starts in Hawaii in November and lasts until February brings the best surfers from all over the world to Waimea. 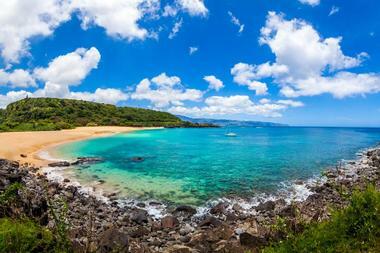 Waimea Bay is one of three Oahu beaches that host the Vans Triple Crown of Surfing.